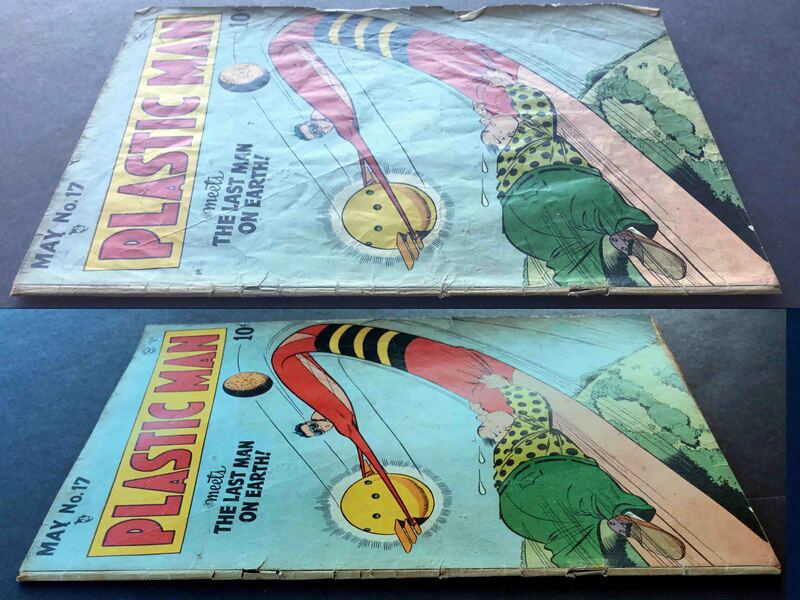 Comic books can be pressed and dry cleaned for an improved look and condition. The process also involves a light dry cleaning with no chemicals or solvents. Amazing results with grade bumps to your books. 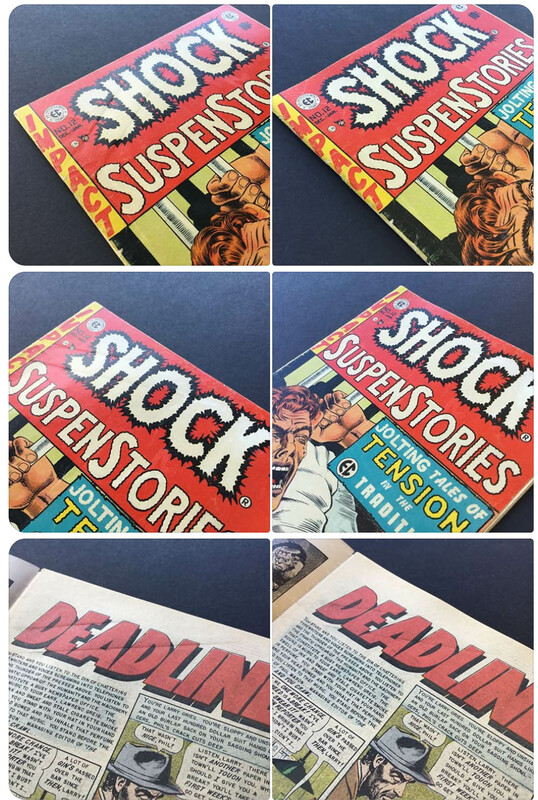 Learn how to press comic books yourself with this free instructional guide. STAPLE PUSH Staple prong pin holes on cover. Too much pressure when improper inspection should have notated the staple prongs need to be pushed down using a plastic putty knife or similar tool. Most common with glued squarebound books such as Silver Surfer 4 or Giant Size X-Men 1. DIGITAL CODE SQUARES Marvel Digital Code Insert imprints of 1" square on last 8 pages of book, including back cover. Improper preparation for pressing a book with a digital code. The pressure of the press imprints the digital code into each page before and after the code. You must use cardstock paper or copy paper to cushion each page before and after. 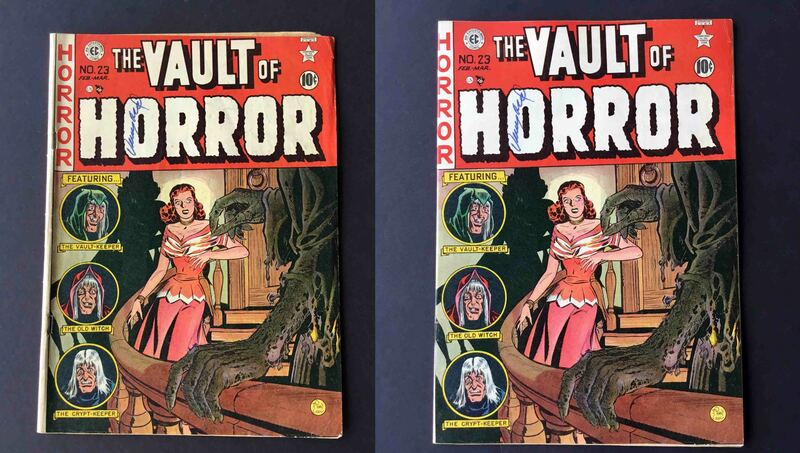 (Up to 4 pages before and after to back cover). COCKLING Wrinkles on cover. Re-using SRP paper and cardstock or copy paper. Always use SRP paper once and done. You will imprint wrinkles from used SRP paper right into the next book you press. If your book has a spine roll to it, you should consider spine realignment as well. 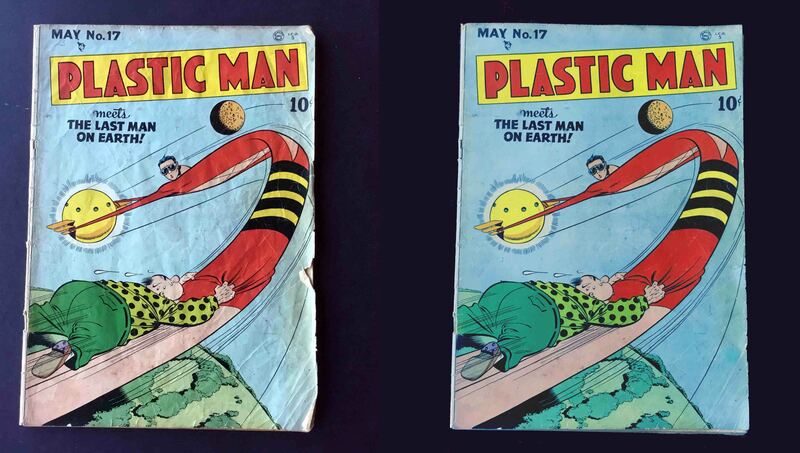 Adjusting the spine of a comic book can be risky. Other damage may occur from staple movement, spine splits, loose pieces becoming detached, or spine chipping if the book is brittle. New Marvel Comics modern age comic books have digital code inserts in the last 4th page of every interior book. 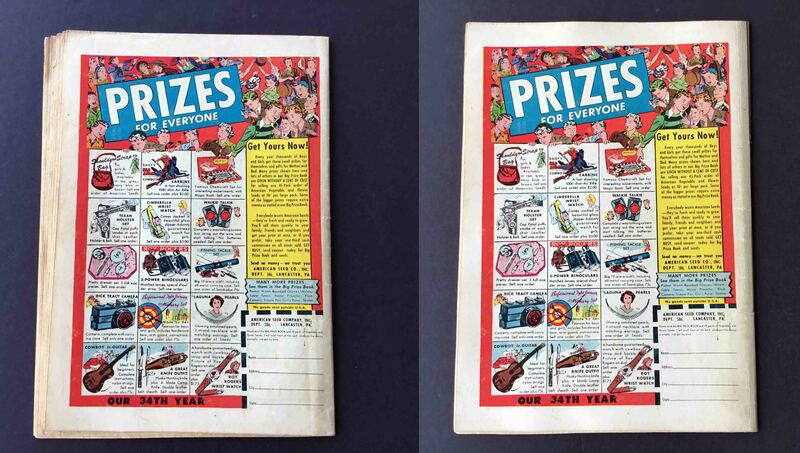 Some books also have Tattooz inserts or other items, such as Image #0 coupons and Mark Jeweler's Inserts. These books require a different and careful approach so the digital code does not press or imprint a 1" square onto the back cover and adjoining interior pages. WHAT DOES COMIC BOOK PRESSING NOT FIX? Color breaking creases on covers. Loose or missing staples. Loose or missing pieces or pages. Staple indentations. Moisture stains. Color or ink breaking spine ticks. Scratches. Scratches on black covers. Books folded in half. Ballpoint pen ink. Marker ink. Date stamps. Library stamps. Deep indentions along front spine. Blunted corners. I am not a miracle worker. Please consider these conditions prior to submitting a book for pressing. IS "PRESSING" CONSIDERED RESTORATION BY GRADING COMPANIES? No. Pressing is a non-invasive method of restoring the original flatness of a book as if it were just printed. Heat and steam are used sometimes to restore spine placement, and helps move creases and fold flaps back to original placement. No chemicals or inks or paints or any similar methods are used on any books. Grading labels will not state "restored" on the label once a book has been pressed. Dry pressing and dry cleaning your book does not use any chemicals or moisture. Only pencil marks and crayon is safely removed from dry cleaning. The heatpress machine and the temperature does not lift sharpie marker or ballpoint pen. Signed or witnessed signature series books are completely safe from ink being lifted during pressing. Paint markers used on signatures cannot be pressed or graded. Cleaning and looking over the book during inspection can take over a few hours. Cleaning alone can take several hours depending on what is being cleaned and how cleaning should be approached. Once your book is actually being pressed, it takes 5-7 min under high heat and an additional 24 hours or more to cool down using a singular heat/cold exchange method of pressing by allowing the book to completely cool back down while still pressed. The process itself can take 25-30 hours total per book. Some books require pressing to be left over several days and nights while still inside the comic book press. Spine roll realignments can take an additional 2 hours or more, depending on severity of spine condition. Pressing a book does have inherent risks. The spine can split. Centerfolds can become loose from a top or bottom staple (or both). Cleaning can rub off surface gloss or ink. If a book is brittle there is risk of chipping and pieces coming loose or removed completely. Spine splits can become worse during a press. You must understand these risks and make an informed decision before chosing to have a book pressed. In most cases, the risk is minimal. These risks are mostly associated with Golden Age and Silver Age comic books. 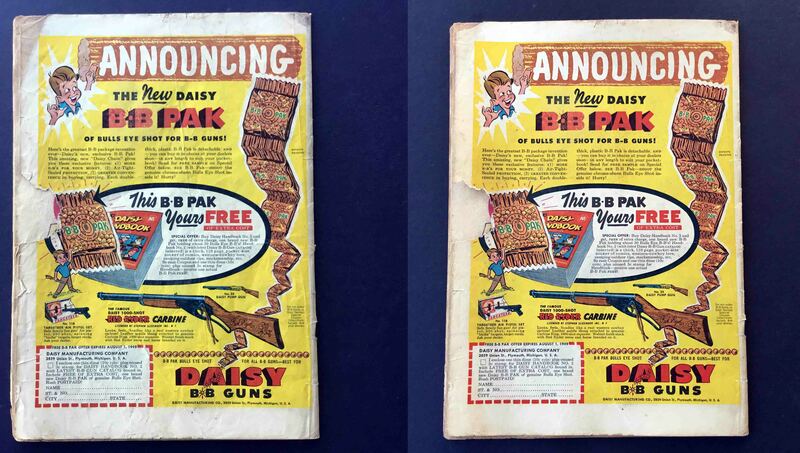 Pre-screening is important because sometimes a book is best left in its present condition if the benefits do not outweigh the risks due to value or rarity of book. Send me photos of your books to kaptainmyke@gmail.com if you have any questions.